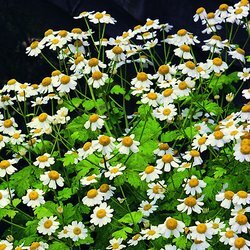 Easy to grow Feverfew has very bright yellow/green leaves with serrated edges with a pungent smell you will either like or hate. Daisy like flowers of white and yellow/orange centre. Feverfew is said to help reduce migraines and flowering stems can be used as a moth repellent. Once the plant has established&comma; do not cut back too harshly as they will not grow back&comma; leave at least 5cm.